The war potential of the nation was at a record low. The backbone of both the fleet and the air forces had been broken in the Philippines, while the Army's ability to concentrate for a final effort was hampered by its commitments to many scattered and now isolated theaters. More serious than even the long chain of tactical defeats which had all but destroyed Japan's armed forces, however, was the rapid disintegration of the national war economy at its base. craft, heavy bombers, tanks, artillery, new rocket weapons, and fleet carriers.7 In the Philippines and the Marianas the enemy had excellent staging bases from which to launch the next effort. 1. Complete the occupation of key areas on Luzon as soon as possible. a. A two pronged advance into the Homeland defense perimeter to secure advance bases and tighten the blockade of Japan Proper. The eastern advance would move from the Marianas into the Ogasawara (Bonin) Islands in February or March. On the west, a much heavier offensive would move from the Philippines to one or more key points bordering on the East China Sea including Formosa, the Nansei (Ryukyu) Islands, and the lower reaches of the Yangtze River, this operation to commence in March or April. The two prongs of the advance would converge in the final assault on the Homeland in the fall of 7945 at the earliest. b. An advance from the central Pacific into the Ogasawara (Bonin) Islands and thence directly to the Homeland, (this operation to begin in February or March,) invasion of Japan Proper, in this case, to be in June or July. 3. In conjunction with operations on the southern approaches to the Homeland, the enemy would probably launch a secondary offensive from the Aleutians against the Chishima (Kurile) Islands in order to capture advance air bases. A direct attack on Japan Proper without these preliminary steps was regarded as a remote possibility. Within the framework of the most probable Allied strategic plan, it was believed that Iwo Jima in the Bonin Islands would be the next invasion target, with Okinawa in the Ryukyus following soon thereafter. 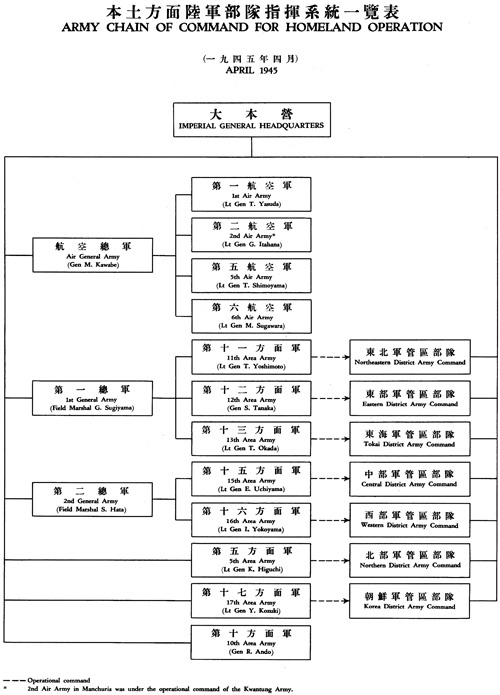 Peripheral commands under Imperial General Headquarters included the Fifth Area Army under Lt. Gen. Kiichiro Higuchi, responsible for Hokkaido, the Kurile Islands, and Karafuto;9 Lt. Gen. Tadamichi Kuribayashi's Ogasawara Group in the Bonin Islands; and the Tenth Area Army under General Rikichi Ando, responsible for Formosa and the Ryukyu Islands. repair and training activities in the Hiroshima-Kure area11 and the Sixth Fleet under Vice Adm. Shigeyoshi Miwa, comprising Japan's 52 remaining submarines. For long-range offensive air operations Admiral Toyoda had at his disposal the Third Air Fleet under Vice Adm. Kimpei Teraoka in the home islands, the First Air Fleet under Vice Adm. Takijiro Onishi in Formosa,12 and Rear Adm. Chikao Yamamoto's 11th Air Flotilla, an independent unit, on Kyushu. Of these, only the latter was at this time in a state of real combat readiness. In addition, the 302d, 332d, and 352d Naval Air Groups were attached to the Eastern, Central, and Western District Armies respectively for interceptor operations. This added about 100 fighters to the air defense system. 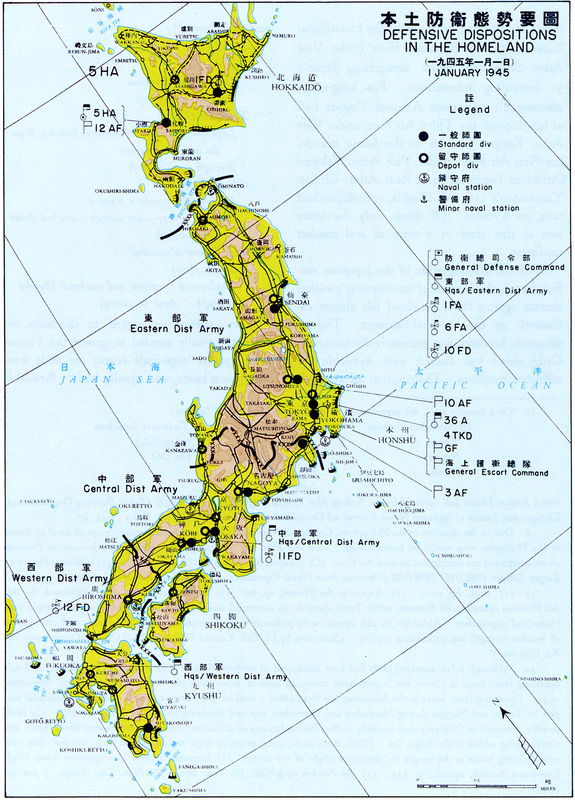 These Army and Navy forces were concentrated principally in the Tokyo-Yokohama, Osaka-Kobe, and Shimonoseki-Moji areas, and around vital naval installations such as Yokosuka, Kure, and Sasebo. reaching strategic plan to replace the now-defunct Sho-Go plan. 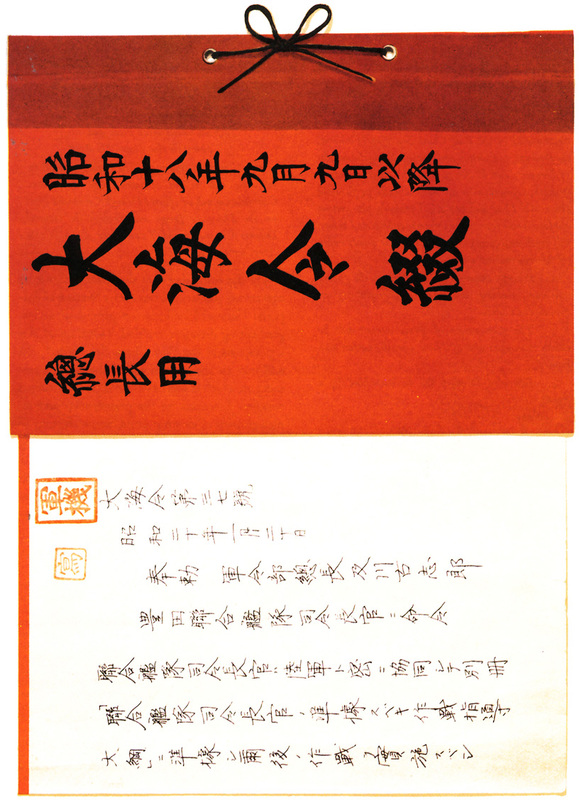 In the pessimistic and confused official atmosphere of this period, further complicated by inter-service differences, it was difficult to formulate even the most general of policy directives.23 However, the need for action was imperative, and Imperial General Headquarters, on 19 January, submitted for Imperial sanction the draft of a general policy directive known as the "Outline of Army and Navy Operations." This directive, having been approved by the Emperor, was officially promulgated on 20 January and became the basis for all future Homeland defense planning. a. The final decisive battle of the war will be waged in Japan Proper. b. The armed forces of the Empire will prepare for this battle by immediately establishing a strong strategic position in depth within the confines of a national defense sphere delineated by the Bonin Islands, Formosa, the coastal sector of east China, and southern Korea. c. The United States will now be considered Japan's principal enemy. Operational planning of all headquarters will be directed toward interception and destruction of American forces, all other theaters snd adversaries assuming secondary importance. a. Resistance will continue in the Philippines so as to delay as long as possible the enemy's approach to the Homeland defense perimeter. b. Key strongpoints to be developed within the perimeter defense zone include Iwo Jima, Formosa, Okinawa, the Shanghai district, and the south Korean coast. The main defensive effort will be made in the Ryukyus area. Preparations in the perimeter defense zone will be completed during February and March 1945.
preponderance in ships, aircraft, and men, to obstruct the establishment and use of advance bases, to undermine enemy morale, and thereby to seriously delay the final assault on Japan. The air forces will make a maximum effort over the perimeter defense zone. Enemy troops that succeed in getting ashore at points on the Homeland defense perimeter will be dealt with by those ground forces on the spot without reinforcement from other theaters. d. Emphasis in ground preparations will be laid on Kyushu and Kanto. 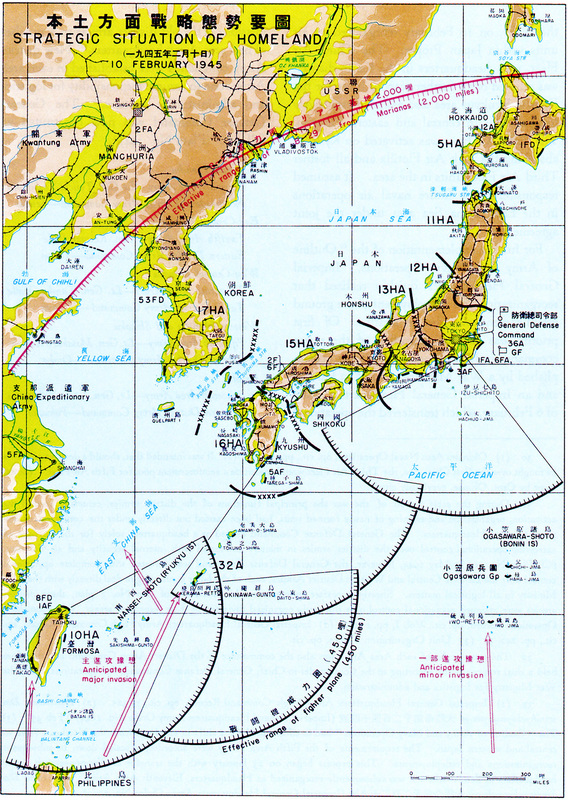 Strong air defenses will be established along key lines of communication, such as the Shimonoseki and Korea Straits, and at important ports and communications centers such as Tokyo, Nagoya, Osaka-Kobe, and theMoji-Kokura-Yawata area. e. During the delaying operations in the forward area, preparations for the decisive battle will be completed in Japan Proper by the early fall of 1945.
f. In general, Japanese air strength will be conserved until an enemy landing is actually underway on or within the defense sphere. The Allied invasion fleet will then be destroyed on the water, principally by sea and air special-attack units. 1. The General Defense Command will secure the Homeland by destroying any enemy invading force. Emphasis in operational preparations will be on the Kyushu, Kanto, and Tokai26 districts. Efforts will be made to annihilate the Allied forces on the sea through the vigorous application of special-attack tactics. 2. The China Expeditionary Army will shift to a two front campaign and concentrate forces in the east and south China coastal sectors. It will secure the continental key area by destroying any enemy invading force. Main defensive effort will be in the lower reaches of the Yangtze River. 3. Southern Army will secure key points in the southern area and check the advance of the enemy toward the Homeland defense perimeter, thus facilitating the over-all operations. 4. Tenth Area Army will secure Formosa and the Ryukyus by destroying any enemy invading force. 5. Seventeenth Area Army27 will shift operational emphasis from northern to southern Korea and secure key sectors by destroying any enemy invading force. On 30 January, the Navy Section of Imperial General Headquarters conducted a conference in Tokyo of the chiefs-of-staff of all fleets and naval districts. The "Outline of Army and Navy Operations" was presented to the conference and preliminary plans and general missions promulgated. 1. 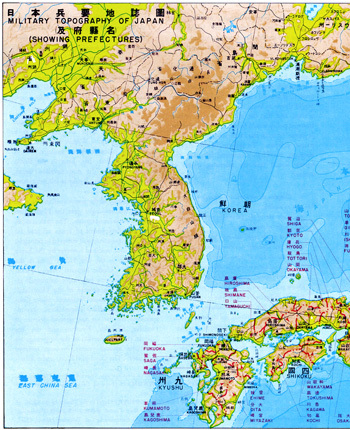 All Army and Navy air forces in the Homeland (less air defense and training forces) will be concentrated in the East China Sea area (Formosa, the Ryukyus, east China, and Korea) during the months of February and March 1945. This concentrated air strength, together with air units already in Formosa (First Air Fleet and 8th Air Division), plus certain reinforcements from other theaters, enumerated below, will crush any enemy attempt to invade points within the aforementioned area. 2. Primary emphasis will be laid on the speedy activation, training, and mass employment of air special-attack units. 3. The main target of Army aircraft will be enemy transports and of Navy aircraft, carrier task forces. 5. 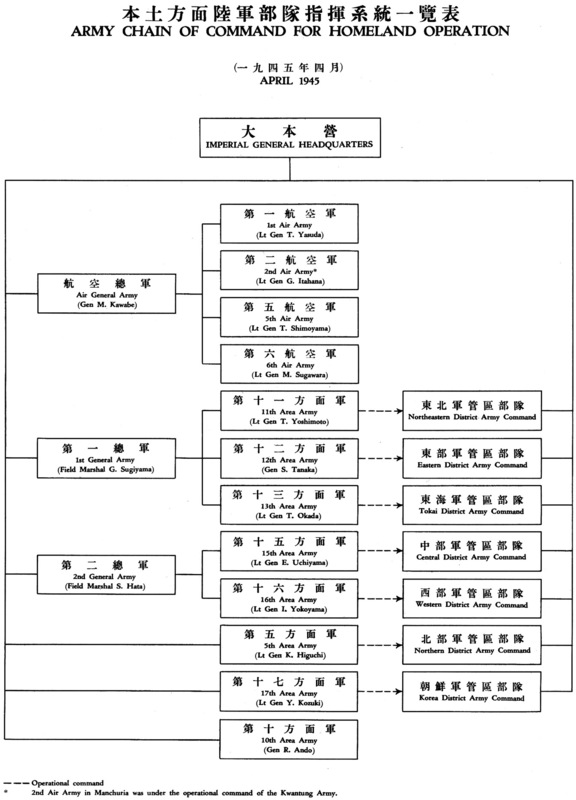 Command System: The basic command relationship will be one of inter-service cooperation. Coordination will be effected through Combined Fleet for the Navy air forces and through the General Defense Command and Tenth Area Army for the Army air forces. 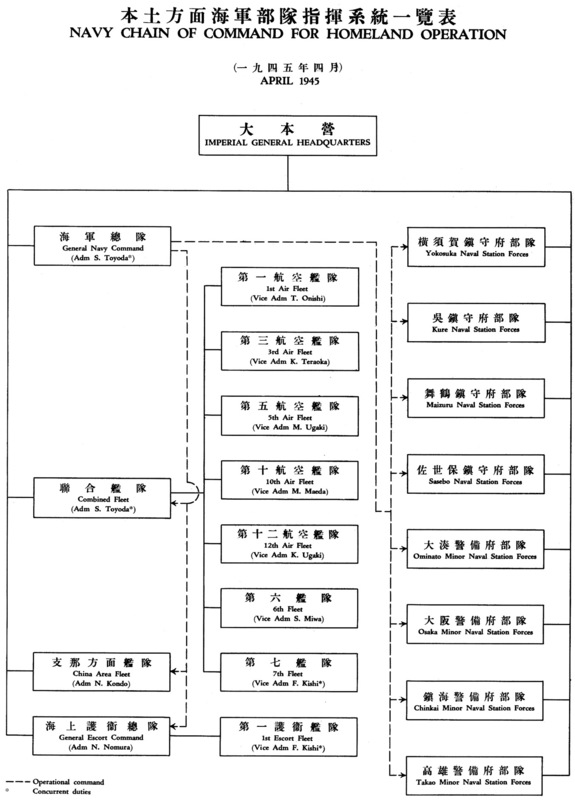 In addition, during the period of the second mobilization, three line combat infantry divisions and one armored division were to be moved from Manchuria to the Homeland. 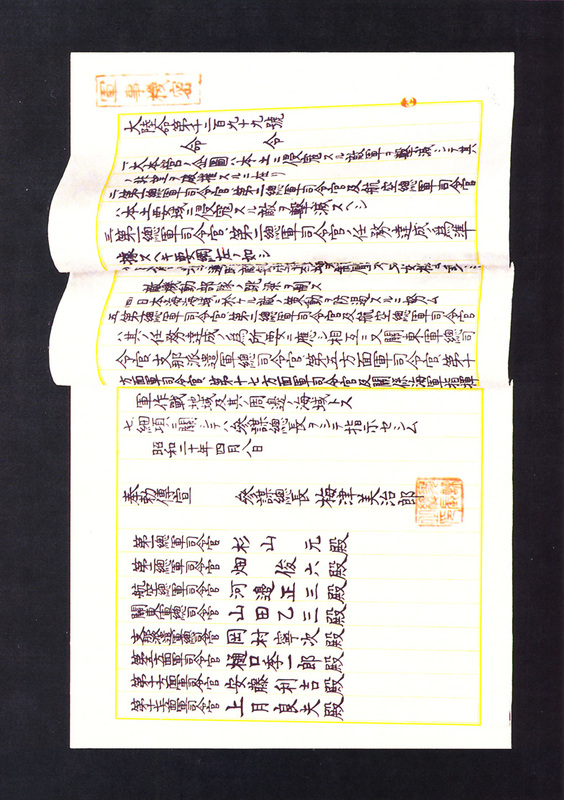 This redeployment, together with the planned mobilizations, brought the projected total of Homeland (less Hokkaido) defense ground forces to a basic combat strength of 26 line combat divisions, 22 coastal combat divisions, and 21 independent mixed brigades.39 Armored composition was fixed at two armored divisions and six tank brigades. Aircraft production presented a special problem due to the concentrated attention being given the industry by enemy air units. Based on the assumption that production could be increased slightly over the average output in December and January,43 the Supreme War Direction Council adopted a figure of 16,000 planes as the goal for the period April through September.44 Production during the quarter ending in March was to be allocated exclusively to the Ten-Go Air Operation. Long-range preparations for the defense of the Homeland had barely gotten underway when enemy attacks on the defense perimeter began. On 19 February, a powerful U. S. amphibious task force launched an invasion of Iwo Jima, keystone of the Ogasawara Island sector of the perimeter. of air attacks on large urban areas in the Homeland which rocked the nation to its very foundations. Switching from high explosives to incendiaries, the B-29's began these operations on the night of 9-10 March with a heavy raid on Tokyo. The new tactics caught the Japanese completely off guard, and the re sults were indescribably horrifying. Well over 250,000 houses were destroyed, rendering more than a million persons homeless, and 83,793 were burned to death.47 Between 10 and 17 March, raids on the same pattern were flown against Osaka, Kobe, and Nagoya. B-29 raids from November through February had been little more than an annoyance to the Japanese, but with the beginning of the fire-bomb campaign, enemy strategic bombing loomed for the first time as a threat to the entire social and economic fabric of the nation. With the invasion of Iwo Jima and the sudden acceleration of the aerial offensive against Japan, it was clear that a move into the East China Sea area could not be far distant. The Navy, which had originally entertained considerable reservations about an air operation in that area before May, suddenly took steps to meet the emergency. 1. The Ryukyu Islands are designated as the focal point of the decisive battle for the defense of the Homeland. 2. Special emphasis will be placed on the de struction of enemy ships by the prompt and vigorous use of sea and air special-attack forces. 3. Hit-and-run raids will be conducted against forward American attack bases to delay the launching of an enemy invasion of the East China Sea area. 4. 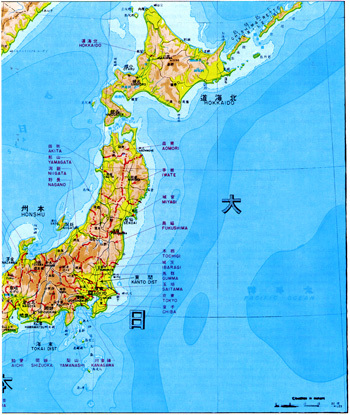 At the same time, the defenses of the Homeland will be strengthened with emphasis on Kyushu and the Kanto area. Defenses at important straits and bay entrances will be strengthened. Sea routes to the continent will be protected. Meanwhile, the preliminaries of the East China Sea air battle were already underway, giving the Japanese no time to complete their long-range preparations. Early on the morning of 17 March, Imperial General Headquarters learned through intelligence channels that sizeable American fleet elements had quit Ulithi atoll in the western Carolines. It was assumed that the enemy task force was on its way to attack the Kyushu area. The attack was expected the following day. shipping crisis deepened, transport of essential supplies to the southern Homeland battle theater became almost impossible. The battle on Okinawa went badly from the very beginning. Handicapped by insufficient troop strength,64 Lt. Gen. Mitsuru Ushijima, commander of the Thirty-second Army, had concentrated the bulk of his forces on the southern portion of the island, where the terrain was relatively favorable to a strong defense. This, however, left the central sector of the island, containing two valuable airfields, virtually unguarded. The enemy landed directly in this weakened sector and quickly mopped up the small security detachments stationed there. Lt. Gen. Ushijima's forces to the south dug themselves in on strong battle positions in the Naha-Shuri area. By the end of the second week of the campaign, enemy forward elements began to approach this line preparatory to a show-down battle. Although continually harassed by enemy air raids on the Homeland, Combined Fleet finally succeeded during the first week in April in effecting a partial concentration of air forces in Kyushu. Execution of the Ten-Go operation then began in earnest. situation. The Thirty-second Army ground offensive of 4-5 May made limited gains against exceedingly strong resistance, faltered, and fell back after a bloody two-day fight. Following this, Thirty-second Army was no longer capable of effective offensive action. 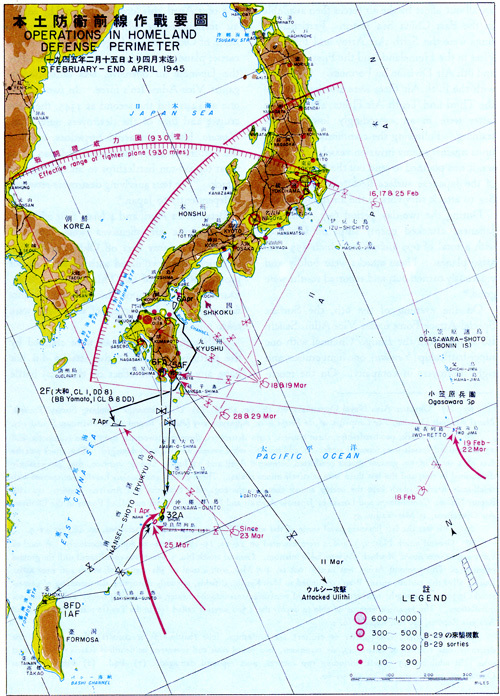 Although the Ten-Go air operation was sustained for another six weeks, the enemy was securely in possession of Okinawa as a forward base after the failure of the 4 May offensive.70 All of Japan south of Tokyo, as well as Korea and the lower Yangtze, were now brought within easy range of enemy land-based fighters. Just as the battle for control of the East China Sea area began, the Japanese High Command learned through intelligence channels that Soviet Russia had begun to redeploy troops from the European theater to the Far East. In Europe, the crossing of the Rhine by the Allied armies and the catastrophic defeats suffered by the Germans in the Saar and Ruhr valleys indicated that final collapse of Hitler's forces was imminent. Japan faced the dread of fighting the war alone. a. The Imperial Army will hasten preparations to meet and crush the attack of U. S. forces in the above key areas. Emphasis will be on the Kanto area (Ketsu No. 3) and Kyushu (Ketsu No. 6). Emergency preparations in Kyushu will be completed by early June. Dispositions will continue to be strengthened during the second phase, and all tactical plans completed. Final deployment of field units and perfection of the field positions will be completed in the early part of the third phase. (1) A close watch will be maintained over all enemy fleet movements, particularly transport convoys. Air search over the approaches to the Homeland will be continuous and aggressive. (2) Enemy amphibious task forces attempting to invade the Homeland will be destroyed on the water. (3) The primary target of the air offensive will be transports. (5) Air support for ground forces will be restricted to liaison missions and tactical reconnaissance in extreme emergencies. (6) Long-range, surprise air raids against such enemy bases as Iwo Jima and Okinawa will be carried out. (1) The ground forces will win the final decision by overwhelming and annihilating the enemy landing force in the coastal area before the beachhead is secure. (2) Speedy maneuver of the largest possible force against the enemy landing sector is the key to success in such operations. As many local reserves as possible must be maneuvered into the expected landing sector as soon as it becomes known that the enemy intends to land. After the enemy has landed, additional ground troops from other parts of the Homeland will be deployed to the area in accordance with the plan prescribed in Para. 3 below. (3) In the event of simultaneous invasions of more than one area, the main Japanese counteroffensive will be directed at the main enemy landing. Delaying actions will be fought in other localities. This principle will apply both tactically and strategically. (4) If the location of the enemy's main landing is undetermined, the main Japanese force will be committed in the area which presents the most favorable terrain for offensive operations. Delaying actions will be conducted in other localities. This principle will apply both tactically and strategically. (6) Special security precautions will be taken at vital installations to forestall enemy airborne penetrations. (1) Air defense of the Homeland will be emphasized. Points of first priority will be Tokyo, cities lying on the principal routes of communication, vital industrial facilities, airfields and munitions dumps. (2) Increasing emphasis will be placed on air raid precautions and perfecting warning facilities. (3) Dispersal of facilities, particularly airfields, will be accomplished wherever possible. (4) When the ground armies initiate their operational movements to counter enemy landings, their assembly must be covered. by antiaircraft units. Plans will be made for the large-scale diversion of such units to this mission at the appropriate time. (1) In cooperation with the Navy, the defenses of such important straits as Bun go, Kii, and Shimonoseki will be strengthened. Principal harbors will also be strongly defended. (2) Batteries will be stationed so as to prevent penetration by enemy vessels and amphibious landings. Channel defense units will strengthen bomb and shell-proof installations, and will dispose armed boats at strategic points. (1) We will strive to realize our operational objectives through exploitation of the traditional spirit of "Every citizen a soldier." (2) Guerrilla resistance will aim at the obstruction of enemy activities and the attrition of enemy strength through guerrilla warfare, espionage, deception, raids on rear areas, and demolition of enemy installations. Such resistance will be carried out as part of the overall operation to assist line units, to meet enemy airborne operations and small secondary amphibious landings, and to cut off and harass enemy elements which penetrate into the interior. (3) Internal security will aim at protecting military activities, vital communications, transport, power sources, and secret areas. 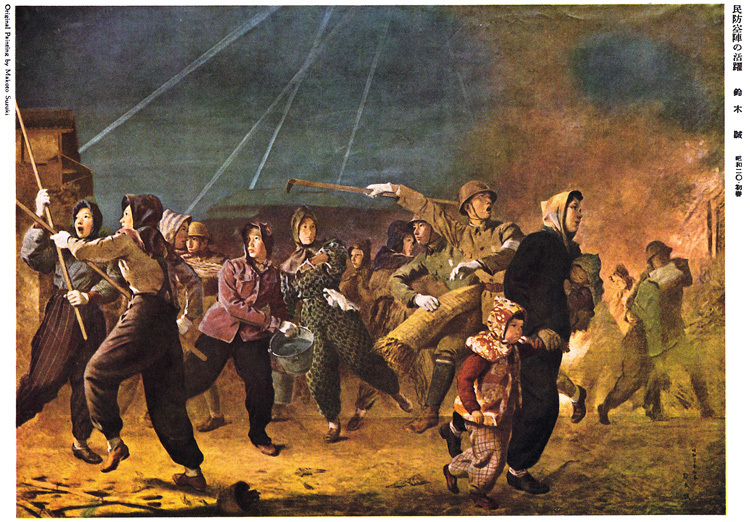 If necessary, internal security will quell public disorder arising as a result of air raids, bombardment, invasion, propaganda, and natural disaster. (4) Forces for guerrilla resistance and internal security will be drawn from the entire body of the citizenry as the situation may dictate. Guard units and civilian defense organizations will provide manpower, organized around small elements of the field forces as a guiding nucleus. Such units will be under the command of the various district army commands. (1) Four line combat divisions will be dispatched to Sixteenth Area Army from forces available to Thirteenth and Fifteenth Area Armies in central and western Honshu and Shikoku. 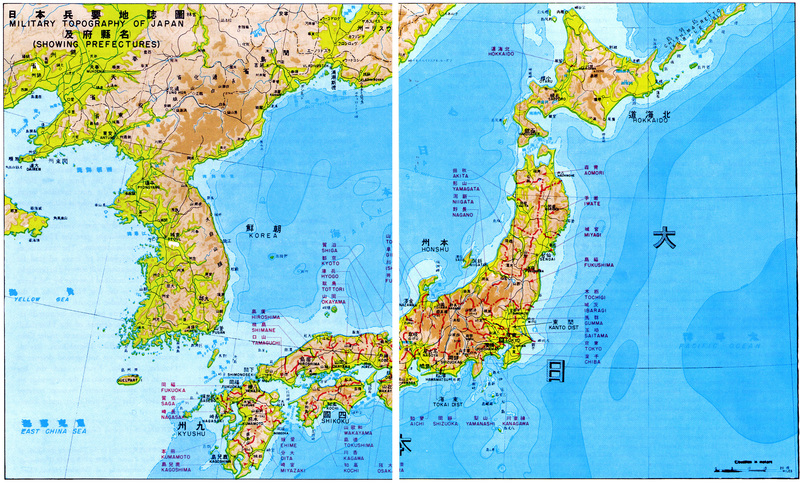 divisions will be dispatched from the Eleventh Area Army in northern Honshu and from Twelfth Area Army in the Kanto district to the Osaka-Kobe area, where they will be held in readiness for further advance to Kyushu. (1) Three line combat divisions from Eleventh Area Army in northern Honshu, three from Fifteenth Area Army in the Osaka-Kobe area, and two from Sixteenth Area Army in Kyushu will be immediately sent to Twelfth Area Army and held in readiness in Nagano Prefecture as a mass counterattack force. (2) If the situation permits, two line combat divisions will be speedily dispatched by Thirteenth Area Army from the Nagoya area to Twelfth Area Army in the Kan to district. (3) Preparations will be made for the advance of a second increment. Two line combat divisions will be sent by Fifth Area Army in Hokkaido to Eleventh Area Army in northern Honshu, and five divisions from Sixteenth Area Army on Kyushu to Fifteenth Area Army in the Osaka-Kobe district, all these divisions to be held in readiness for further advance to the Kanto district. (1) The Homeland will immediately enter the status of a battle theater communications zone. (2) Emergency logistic preparations called for under this plan will be completed by the end of June. The full program will be perfected by the end of October. (3) Successful completion of this program is dependent upon securing maximum efficiency in production and procurement, use of transportation facilities, security of logistics installations, dispersal operations, transfer of service units and supplies from the Continent,75 and maximum utilization of idle materials. (4) In order to meet the expected gradual increase in pressure upon land and sea transportation services, self-sufficiency in each district and area Army will be emphasized, particularly as regards food, materiel repair, and certain classes of arms and equipment procurement. (5) The logistics base (excluding Korea) will be 2,903,000 men, 292,000 horses, and 27,500 motor vehicles. (1) As far as items of organizational equipment are concerned, the furnishing of new troop units will have top emergency priority over all other supply activities, emphasis being placed on units in the Kanto area and Kyushu. (2) The over-all build-up targets for expendable items (excluding the normal unit allowance) will be, in the case of ammunition, enough for one campaign by the entire projected field strength (2,000 tons per division), and of fuel, food, and forage, enough for 1½ months of combat operations.76 The main stockpiling areas will be the Kanto and Kyushu areas. (3) Only in Kyushu and the Kanto will the full ammunition unit of one campaign be available in operational stockpiles. Other areas will have such fractions of one unit as are prescribed. (1) At the commencement of the operation, operational supplies will be released to the engaged units immediately in sufficient quantity to raise the supply level of the active theater up to two campaigns in ammunition and four months supply of fuel, forage, and rations. (2) Supplies will be released from the reserve by Imperial General Headquarters as the situation requires. (1) Emphasis will be placed on expanding facilities for aircraft maintenance, preparation of ordnance for special-attack units, and dispersal of fuel dumps. (2) Special-attack units will have first priority in all matters of supply. Sixth Air Army which, until the completion of the Ten-Go operation, was to remain under the operational command of Combined Fleet. The organization of all these headquarters was completed by 15 April. 2. The Commanders of the First General Army, Second General Army, and Fifth Area Army, hereinafter referred to as the senior commander(s) of the Army forces concerned, will be in command of all land operations in their respective zones of responsibility, including those conducted by naval troops. 3. All land operations at naval bases and naval stations will be under the immediate command of the commandant of the appropriate naval station. This officer will in turn come under the senior commander of the Army forces concerned. 4. During the period of operational preparations, the senior commander(s) of the Army forces concerned are empowered to issue general instructions to naval land troops concerning security, defense plans, tactics, and training. 5. Designated Army coastal installations in the vicinity of large naval bases will be placed under local navy command. 6. Upon activation of the operation, the Navy (Army) ground antiaircraft units in the zone of oper ations of Army (Navy) ground units will be placed under the appropriate Army (Navy) commander. 7. Sea and air special-attack bases will be de fended against land attack by the service operating the base. However, upon activation of the operation, such defense troops will be placed under the command of the Army or Navy commander controlling ground operations in the area concerned. 8. Local agreements necessary to carry out this general agreement will be concluded immediately. The wholesale mobilization of the national potential required to implement the Ketsu-Go plan obliged Imperial General Headquarters to give the nation frank warning that the Japanese home islands, inviolate through centuries, now stood in imminent peril of feeling the tread of an invader's heel. This dread prospect evoked in the Armed Forces and civil population alike a readiness to take the most extraordinary measures to repel the enemy. b. Long-distance surprise air raids will be launched against enemy advance bases such as Ulithi, Iwo Jima, and Guam. a. When the advance elements of the enemy invasion talk force enter the outer Japanese air perimeter, long-range Navy bombers will attack them vigorously, and short-range submarines will launch torpedo attacks. b. When the main invasion convoy reaches a point 180-200 miles off Japan, the massed strength of all Army and Navy air tokko will begin to be committed. Koryu (midget submarines) will also join the attack. invasion. The purpose of these attacks will be to disrupt enemy air activity and thus facilitate Japanese special-attack operations. a. When the convoy is in the process of anchoring, Koryu (midget submarines) will attack in force. b. Kaiten (human torpedo will strike in force at gunfire support ships and transports. c. The anchorage will be kept under constant interdiction, particularly at night, by means of attacks by Shinyo and Renraku-tei (crash-boats. d. Long-range artillery will shell the an-chorage. e. The air tokko offensive will continue. f. While the enemy is engaged in ship-to- shore movement, transports and landing craft will be swept with fire by all available artillery strength. a. The artillery will shift its fire from waterborne targets to the landing beaches. b. Air and sea special-attack forces will continue their attacks. c. Infantry units of the coastal combat divisions will counterattack the invaders immediately from positions close to the beach. These counterattacks will be persistent and continuous so as to disrupt the consolidation of the beachhead and merge the lines in a confused struggle in which enemy air, artillery, and naval gunfire will be seriously hampered in choice of targets. e. Should enemy elements succeed in penetrating into the interior, they will be met with fierce and determined guerrilla resistance. Under this general scheme of tactics, the chief burden of blunting the American invasion spearhead fell upon the air and sea special-attack forces. However, the application of the tokko principle was to be carried much farther than ever before. For the first time in the war, tokko methods were to be used in ground combat on a large scale, by both formal military organizations and partisan groups. it essential to develop an aggressive antitank program relying on other weapons. 1. There was no assurance that Japanese firepower and assault weapons could successfully penetrate an enemy beachhead once it had expanded to the edge of the coastal plain. 2. The coastal zone contained all of the large key air bases. Thus, relying for the most part on the suicidal bravery, ardent patriotism, and fierce loyalty of the people, Japan prepared to wage the final decisive battle against an enemy far superior in both technical resources and manpower.